Seeing how Dragonwake is going to be a card (spoiled here), and some ladder folk suggested an article about Dragons, here it is! A comprehensive overview on the Dragons you'll find on Solis. 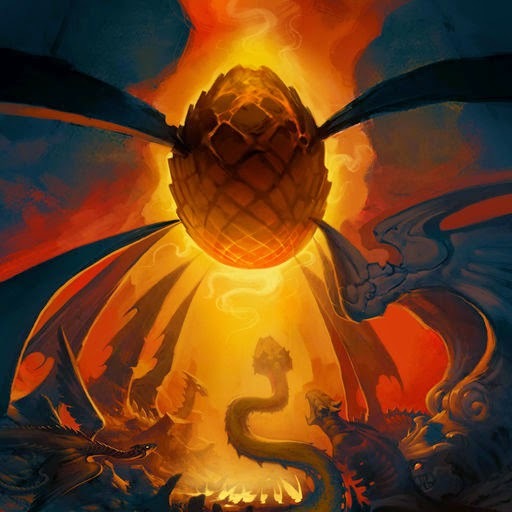 Perhaps the most iconic of Solforge's dragons, Scorchmane Dragon is the definition of a lategame bomb, with its non-existent level one but powerful level two and three. It is often paired with cards that can efficiently bypass its level one, notably Oratek Battlebrand and Steeleye Seer, or cards that can utilise the 0/6 egg to minimise the tempo loss like Nefrax, the Soulweaver and Brimstone Tyrant. Overall, an effective choice if the other cards in your deck can support it and/or you need a late game threat. You read that right, Vaerus is a dragon, so we get to talk about the card too. Battling multiple times has always been a niche ability, generally used for pushing damage, ensuring trades (although by far its weakest use) and triggering cards that do things when they hit your opponent, like Everflame Mystic and Flameblade Champion; Unfortunately, they just aren't very reliable nor any good at all. Vaerus himself can potentially end the game on the spot if you can press for damage, despite its sub-par body. That said, getting to Vaerus 3 is often an exercise in futility, as the first two levels are extremely situational and there are far better things to sneak level. It's a really cool card, but it just doesn't have the support it needs to shine. Similar to Scorchmane in that they both start out as eggs, but while Scorchmane grows into an impressive 12/12, Smolderscale is a bit of a late bloomer, staying in his egg for another level, while offering chip damage while it lives. Unfortunately for our little fried egg, chip damage isn't worth the 2/10 level two, and you're almost certainly better off playing Scorchmane. Frostmane is the perfect example of a solid card that you can't really go wrong with, between its great stats, the potential extra dragon you get off the egg and at a blistering Mobility 2, most Tempys decks would be hard pressed to find a reason not to play it. All that said, at the end of the day, its greatest strength lies not in the power of the card, but rather its reliability. Ah, I remember the disappointment that accompanied the spoiling of this card (People were thrilled at the prospect of an Alloyin dragon after all. ), after its buff it has a little constructed merit, mostly alongside Ambriel Archangel or full-blown defender craziness, mostly a fun card though. The original lifegain win condition before several oozes and a certain tree took over the parade. By today's standards, Arboris is simply too inconsistent to work. A 100/101 is pretty cute though. Doomwing isn't actually a terrible card, considering Borean Windweaver and Ator, Thunder Titan provide powerful support. Its major downfalls include how its fragility and hard-gating, making it just not quite reliable enough to be a card in constructed. Quite the oddball in Solforge, Duskmaw is almost the only card that can provide a defensive blowout, which can help stabilise a losing board. It can also gain you an advantage on an even board. These characteristics coupled with his solid stats make him an extremely viable inclusion in constructed. Really, his only real weakness is that you can't play him alongside other Solbind cards. It does not level the dragon we choose, nor remove it from our deck, or place it into our discard pile. For the first two ranks of the card of the card, the dragon is destroyed at the end of our turn, meaning we should try to obtain immediate value. 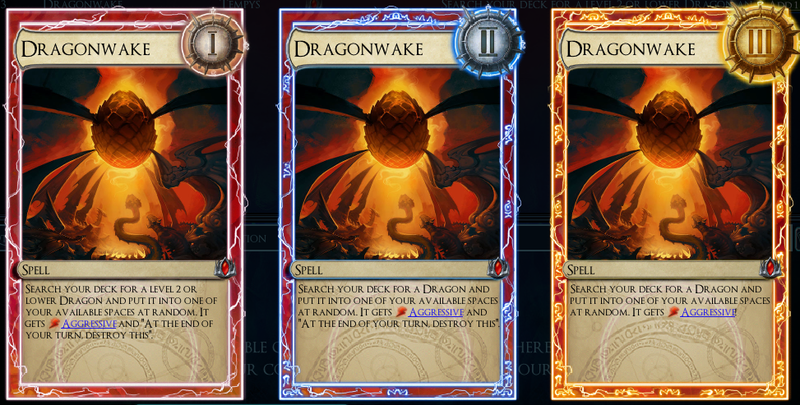 So what can we not do with Dragonwake? Level our Scorchmane or Smolderscale eggs, as the card we pull does not level. What can it do? Be part of a crazy burst combo with a combination of Vaerus, Scorchmane Dragon and Warmonger Mod, instantly destroy creatures with an Aggressive Doomwing and Duskmaw. 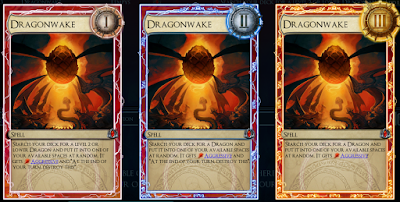 Overall, Dragonwake seems to have a few prospective uses, and it'll only get better as more dragons are added to the game.